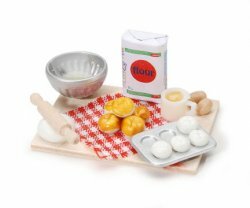 Realistic baking set up...with none of the mess! Eggs in the bowl, with more on the side, flour, dough, baked and ready for the oven buns, and a measuring cup full of oil. Size is 2 inches w. x 1 1/2" d. x 1 1/4" h.